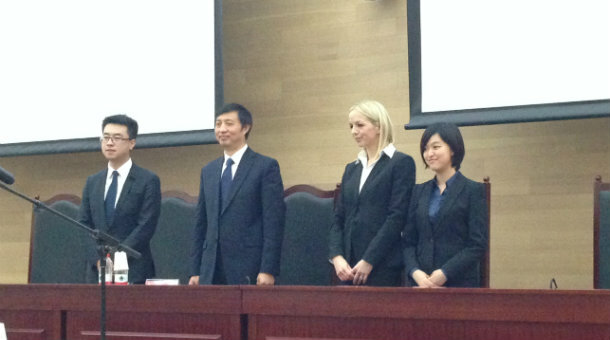 This week, members of UCL Laws visited Peking University to formalise a five-year scholarship agreement, made possible by the generous support of the Hong Kong-based Vinson & Cissy Chu Charitable Foundation and, in particular, Laws Alumnus Winston K S Chu. The Scholarship will be awarded yearly to a deserving Chinese law graduate of Peking University who shows outstanding academic potential and needs financial assistance to pursue a full time Master of Laws degree (LL.M) at UCL. The first scholarship will be awarded in 2016. In addition to the Vinson Chu Peking U/UCL Law Scholarship, the Foundation generously supports an annual conference on the Rule of Law jointly hosted by UCL, Peking University and The University of Hong Kong. The third annual conference also took place in Beijing this week, attracting many distinguished guests and prominent international legal figures. The Honourable Mr Justice Joseph Paul Fok, a Permanent Judge of the Hong Kong Court of Final Appeal and The Right Honourable Lady Justice Hallett DBE, Deputy President of the Criminal Division of the Court of Appeal of England both featured in the conference programme. They were also welcomed as guests of honour at alumni receptions held in Hong Kong and Beijing.